The Seminole Tribe of Florida (along with the Seminole Nation of Oklahoma and the Miccosukee Tribe of Indians of Florida) is one of three federally-recognized tribes of the Seminole people. When the Native people of the Southeastern states were forced to move to Indian Territory, some of the Seminoles retreated into the Everglades, refusing to be removed. Today, the Seminole Tribe of Florida maintains six reservations in the southern part of the state, the largest of which is the Big Cypress Reservation near Clewiston in between Lake Okeechobee and the Everglades National Park. 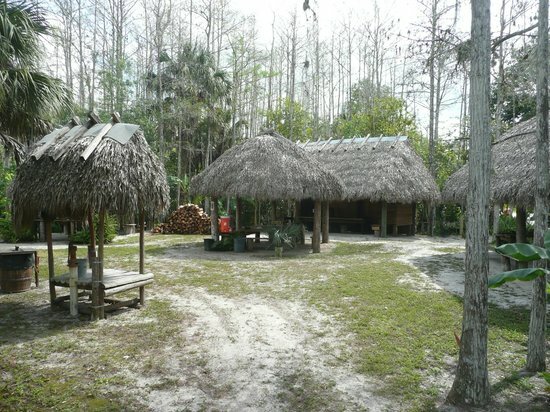 Big Cypress is home to the tribe's acclaimed Ah-Tah-Thi-Ki Museum. Visitors start out in the museum space which includes a short introductory film and galleries depicting traditional Seminole communities and culture. Changing temporary exhibits explore contemporary Seminole life and people, such as the current exhibit on modern reinterpretations of Seminole patchwork clothing. Exhibit runs until Nov. 30, 2105. Outside the museum, a raised boardwalk path leads through a cypress grove, past the Clan Pavilion which presents background information on the eight current Seminole clans, to a replica ceremonial grounds and village. In the village, craftspeople demonstrate how they make traditional Seminole art pieces, which are then for sale. Ah-Tah-Thi-Ki also houses a library and an oral history museum. Much of the oral history recordings are available to tribal members only, but the museum posts some podcasts on their webpage. Some of their archival collections are also online. Big Cypress Reservation is also home to the Billie Swamp Safari, the Junior Cypress Rodeo and Entertainment Complex, and the Big Cypress RV Resort, all of which are tribally-owned. The Seminole Tribe of Florida also owns several other business enterprises across the state (and the world), including the Hard Rock restaurants and casinos, two of which are on their reservations in Tampa and Hollywood, FL. NPR's April 2013 All Things Considered feature "Meeting Florida's Seminoles Through Rediscovered Photos."